PA Thriller HOSTILE Gets Release Date! 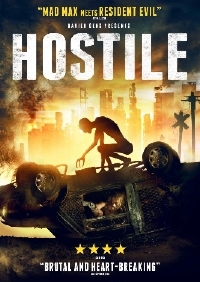 We've been keeping an eye on Mathieu Turi's much anticipated post-apocalyptic thriller Hostile for some time. The project, produced by Xavier Gens (The Divide, Frontier(s)), unfolds in the aftermath of an epidemic which has wiped out most of the world's population. As if surviving after the apocalypse isn't difficult enough, those who are left find themselves scavenging for food and shelter while hiding out from strange creatures that hunt for them at night. Hostile made quite the splash as it made its way through the genre festival circles last year and now it's about to land in North America. Hostile will be available on VOD, Digital HD and DVD on September 4.